How can I increase my website slot limit? You can increase your website slots in two ways. One way is to upgrade your account to Pro or Business. With a Pro account, you’ll get 10 website slots and with a Business account you’ll receive 45 website slots. If you need additional website slots for your account, you can also buy extra slots from booster packs. You can buy 10 extra slots for $4, 20 extra slots for $7 and 40 extra slots for $10. You can upgrade your account and buy booster packs by clicking the red “Upgrade” button on the left side of the dashboard after logging into your account. Scroll to the bottom of the page to view our boosters. The extra website slots booster pack is a monthly subscription that will continue to be renewed every 30 days until unsubscribed or cancelled. Click on the “Subscribe” button of the booster pack you want to purchase to go to the Review Your Order page. Here you can add a promo code or checkout your order by using PayPal or Payza subscribe. After subscribing, you should be sent back to the Purchase Successful page. From here, you can check the account overview to see that your account has been upgraded. You may buy booster packs as many times as you like to fit the desired size of your websites or business. How can I purchase extra traffic points? You can purchase extra points on the upgrade page with one of our booster packs. You can buy 50,000 points for $7, 100,000 points for $12, 200,000 points for $20, 500,000 points for $42 and 1,000,000 points for $68. Similar to increasing your website slots, you can buy booster packs by clicking the red “Upgrade” button on the left side of the dashboard after logging into your account. 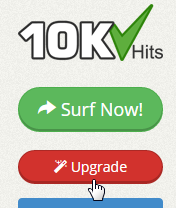 You can move the slider to the right to see how many hits you would get if you change your visit duration. The slider is for your reference only and does not change the amount of hits you are purchasing. Once purchased, you can set the visit duration of your website campaigns individually. 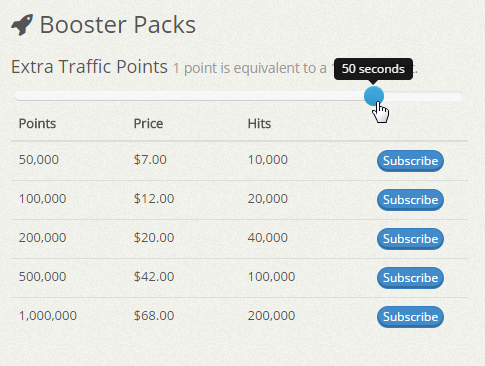 The extra traffic points booster pack is a monthly subscription that will add extra traffic points to your account every 30 days until unsubscribed or cancelled. Click on the “Subscribe” button of the booster pack you want to purchase to go to the Review Your Order page. Here you can add a promo code or checkout your order by using PayPal or Payza subscribe. After subscribing, you should be sent back to the Purchase Successful page. From here, you can check the account overview to see that your account has been upgraded. 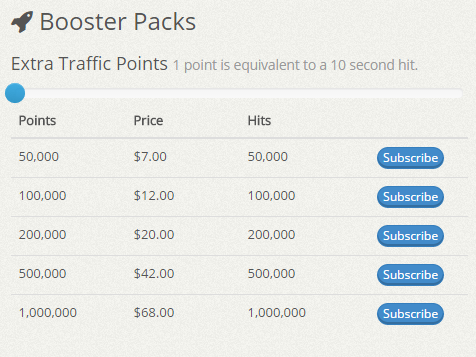 You may buy booster packs as many times as you like to fit the desired size for your websites or business.